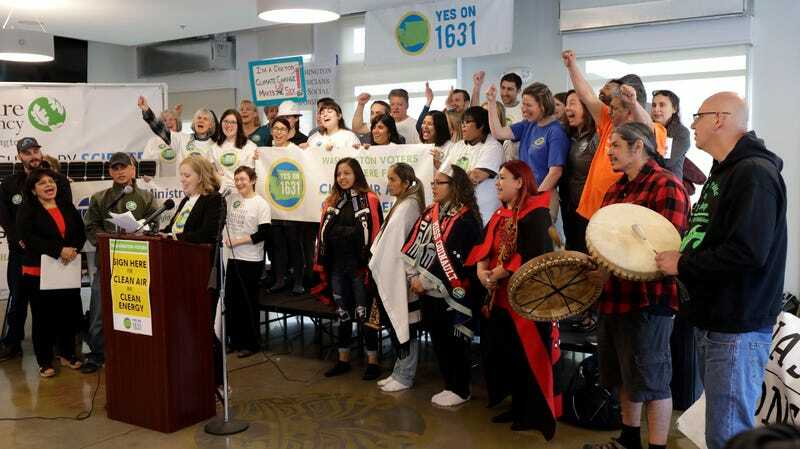 Members of the Yes on 1631 coalition, including members of the Quinault Indian Nation. In Washington state, a coalition has taken a variety of opinions and merged them into something extraordinary. The first “carbon fee” in the nation will be debated across the state as Washington voters decide what side of history they want to be on come November. Initiative Measure 1631, a proposal to charge businesses $15 for every metric ton of carbon they emit that’s appropriately nicknamed the Protect Washington Act, is very likely to be voted on by the state of Washington come November. Yes on 1631, a coalition of more than 150 organizations, only needed 260,000 signatures to qualify for the ballot, and they submitted about 365,000 to Washington Secretary of State Kim Wyman earlier this week. Which is why the group’s campaign is now kicking into high gear. Washington has tried to pass carbon taxes before, most recently this past winter, although that attempt didn’t make it through the Senate. Before then, a carbon tax did land on the ballot, but it failed in part because its creators didn’t include much input from communities of color, labor groups, or any other untraditional environmentalists. White environmentalists seem to have learned their lesson this time around and have worked to get many of those groups on board with the new initiative. This new proposal, if it becomes law, would kick in starting in 2020. Every metric ton of carbon major companies emit—think utilities or big corporations, not the laundromat down the block—would cost them $15. From there, the price goes up every year by $2 until the state finally meets its greenhouse gas reduction goals, of getting emissions to 50 percent below 1990 levels by 2050. That’s no little feat. This new initiative is different than typical carbon tax proposals where politicians and representatives decide where the money goes. All the money collected from the fee would go back into communities across the state to address problems—and solutions!—around climate change. To be exact, 70 percent of the funds accumulated from this carbon fee must go toward clean air and clean energy investments. A quarter of the money should be invested in clean water and healthy forests, which would protect people and property from wildfires (especially Native American tribes that live in these regions). The remaining five percent would go toward preparing vulnerable communities from climate change. Think of neighborhoods in South Seattle, or white rural towns in the middle of the state. In the poor rural town of Centralia, Washington, a coal power plant will begin to shut down come 2020. Then what? That’s part of what this initiative hopes to answer. The transition away from dirtier (and less profitable) fuels often leaves people unemployed and bitter. It doesn’t have to be that way, though. The TransAlta coal plant near Centralia, Washington. “That plant’s going to be shut down, and we want to make sure the workers there are getting taken care of,” Abraham said. That means finding them new jobs and training them in other energy sectors. But the creators of this initiative are also considering people in non-fossil fuel industries like aluminum and agriculture, whose costs would be driven up by a statewide carbon fee. Why would they comply when they can keep doing their thing in another state? That’s why the initiative includes key exceptions to be mindful of labor and people’s means of making a living, as Grist has reported. There is a lot that makes this new initiative attractive. Campaigners grew more ambitious this time around, both in terms of what the initiative should encompass and who should take part. Folks will have to wait until November to see who actually wins this fight. We already know most of Washington state’s voters want something that’ll reduce carbon pollution. The question is: Will 1631 be it? And will the rest of the nation follow suit? What Are Carbon Markets and Can They Save the Planet?